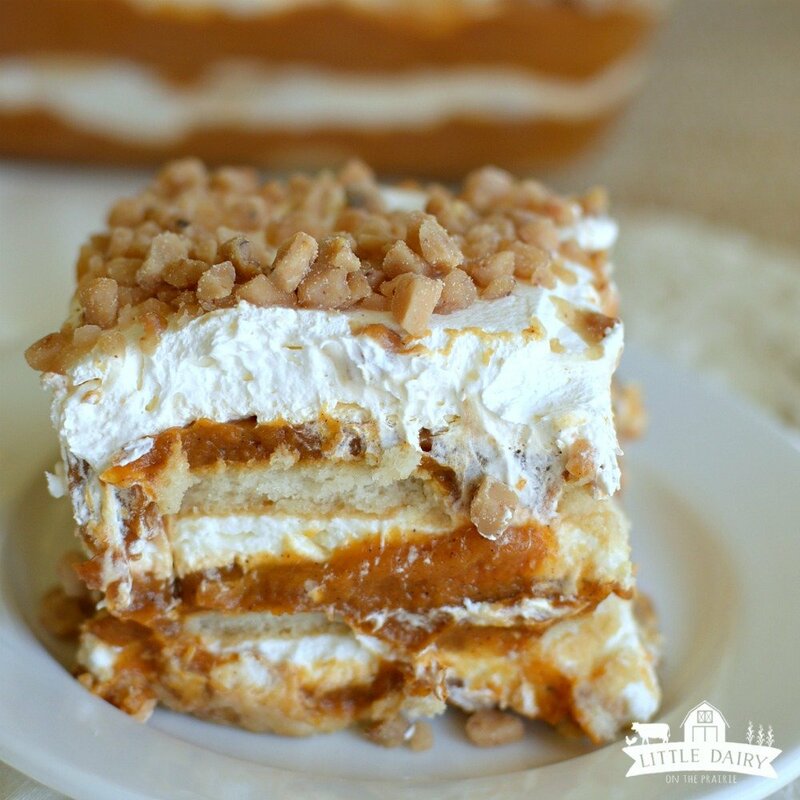 You are going to fall in love with every layer of this No Bake Pumpkin Toffee Icebox Cake! Everything from the cinnamon spiced pumpkin, to the cheesecake layer, to the crunchy toffee chips make perfectly luscious dessert! I always have this illusion that my life will slow down once fall comes. Why doesn’t that happen? Along with the illusion that life will slow down I for some reason believe that I will spend the extra time baking scrumptious desserts and meals for my family. Then I find myself still looking for quick and easy meals and desserts because I still don’t have tons of time to spend in the kitchen. Maybe it’s because I’m trying to catch up from being so busy in the summer. Anyway, the nights have been a little cooler here, my boys started school and I’m starting to dream about PUMPKIN everything! My family enjoyed my No Bake Peach Icebox Cake so much I decided to try a pumpkin version. 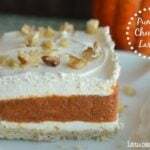 I like texture in my desserts so I decided to add toffee chips and came up with this No Bake Pumpkin Toffee Icebox Cake! It was just right! Of course we had to take the obligatory back to school pics. I decided to photo bomb one of their pics because I figured if I had to put makeup on it deserved a little special recognition. After all, I haven’t worn makeup for days! 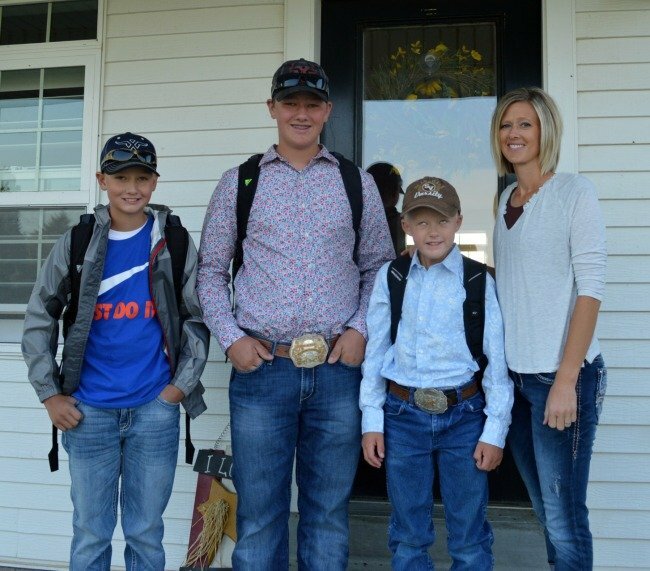 All of us were less than thrilled to send the boys back to school. Justin is missing his work crew, I’m missing my entertainment, and the boys are not loving sitting in class all day. Oh well, we are determined to have a good attitude about school…so enough about that. 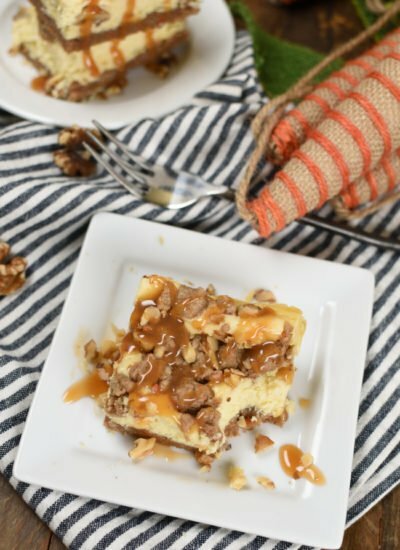 Let’s talk about No Bake Pumpkin Toffee Icebox Cake! Mmm K? Icebox cakes are so easy! 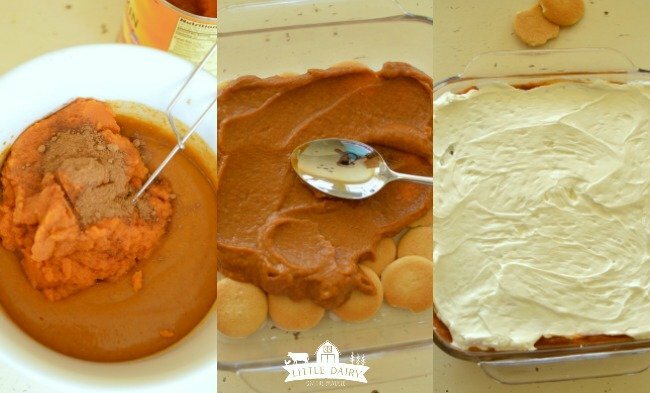 Mix some pudding and pumpkin together, oh and a little pumpkin pie spice. Spread it over any kind of graham cracker, vanilla wafer, or Oreo’s. Add a decadent cream cheese layer. Do the whole thing two more times. Spread with whipping cream and that’s it. Oh, and don’t forget to put toffee chips on top of each cream cheese and whipping cream layer. I love the crunch it adds! There you have it! If you are looking for a dessert that you can throw together in no time and is still super impressive…look no farther! 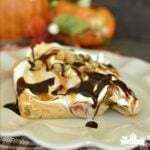 Whip up a pan of No Bake Pumpkin Toffee Icebox Cake and you will immediately have extra friends! It’s that good! P.S. 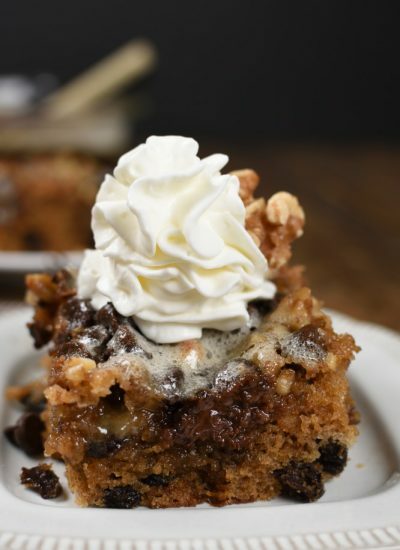 Need one more reason to make this fabulous dessert? It’s best if you make it ahead. It just gets better as it sits! Looking for a super easy dessert that's sure to impress? 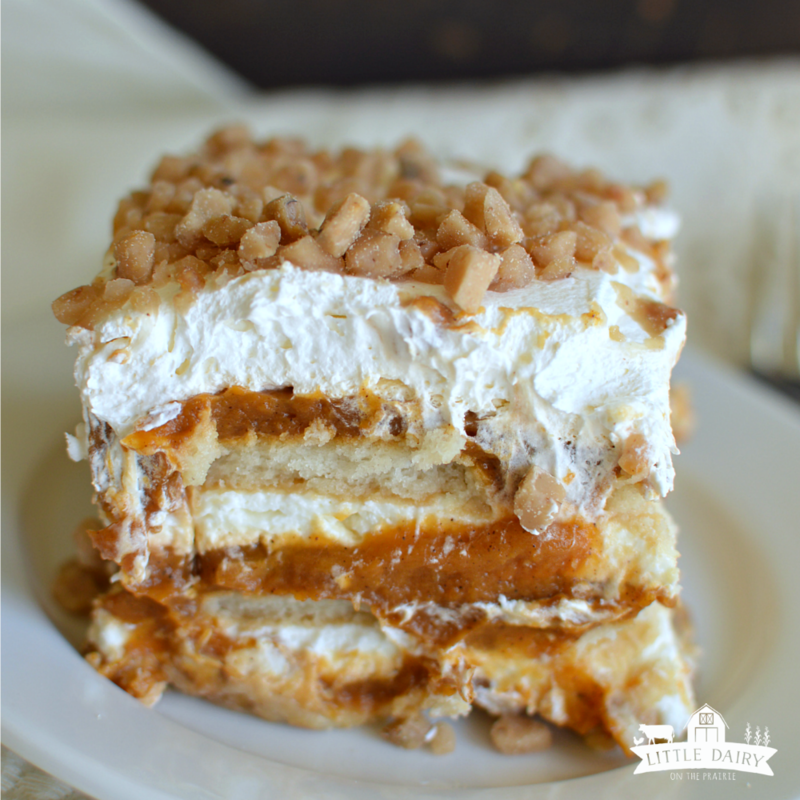 No Bake Pumpkin Toffee Icebox Cake piled high with pumpkin spice, cheesecake, and toffee chips! I used and 9" x 9" square pan. It was almost too much. You could certainly make this in a little bigger pan, even a 9" x 13" pan. It would just be a little shorter. 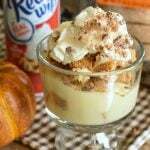 Whisk pudding, pumpkin pie spice, and milk together. Fold in pumpkin. Set aside. Beat softened cream cheese until smooth. Add whipping cream and vanilla and beat until fluffy. Add powdered sugar and beat to combine. Fold in one cup of whipped topping.Set aside. Line the bottom of your pan with Vanilla Wafers (or whatever you are using, we get good at substituting when we don't live near a grocery store). You might have to break them to make them fit. Don't worry if it's not super pretty! Cover cracker layer with a third of the pumpkin mixture. Spread. Spread half of the cream cheese mixture over the pumpkin layer. Spread carefully so you don't mix the layers together. Sprinkle toffee chips over cream cheese layer. I used a generous sprinkling! Repeat again beginning with crackers, then a third of the pumpkin, then remaining cream cheese, then toffee chips. Add one more layer of crackers, then remaining pumpkin. Spread reserved whipped topping over the final pumpkin layer. Sprinkle more toffee chips. Refrigerate for 4 hours or overnight! I like it better after it's had lots of time to sit! This sounds delicious and I love that it’s no-bake! Isn’t no bake the best? I love impressive desserts that only take minutes to make! Probably a dumb question ☺, but do I make the pudding or just use the pudding powder? I always tell my children there are no dumb questions. If you are asking there are probably other people who are confused too. Just use the dry pudding mix. Makes it even easier! You got me at no Bake and pumpkin. Looks yummy and easy enough to try putting it together this weekend. Thank you for sharing. New to your site and looks like my type of good stuff to enjoy reading & learning. Welcome! I’m glad you found my site! Aren’t easy recipes the best? My family survives on them! Happy fall! This looks amazing! Thanks so much for sharing. I will take it to my Square Dance Club The Hobomock Hoedowners in a few weeks for our pot luck! 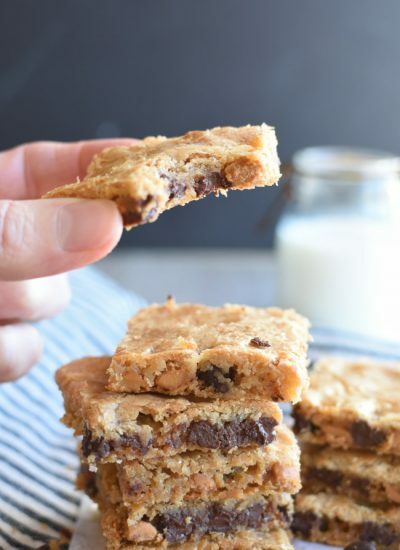 You will love sharing this treat! Have fun dancing! Looks decadent I have to try it. One question though, in your instructions you have one layer of crackers, but in the picture there are several. I’d be inclined to layer crackers after every cream cheese layer. Yes, I did add several layers of crackers. Basically, I layer crackers, pumpkin, cream cheese, toffee chips. Then I repeat that whole thing. Then crackers, pumpkin, whipped topping, then toffee chips. You will love it! Wouldn’t you love it if desert could be delivered to your front doorstep every night? That would be so nice! So,so good…just made it as a test today for our upcoming annual Ox-Roast..I know it will be a hit!!!!! It’s such quick and easy dessert to throw together and still looks impressive! I bet it was a hit! Happy Fall! It looks wonderful. I am going to try it on my family for Thanksgiving. 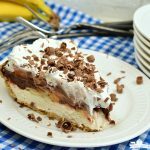 Making this dessert is so easy and is always a hit! You need a few of those recipes during the holidays! 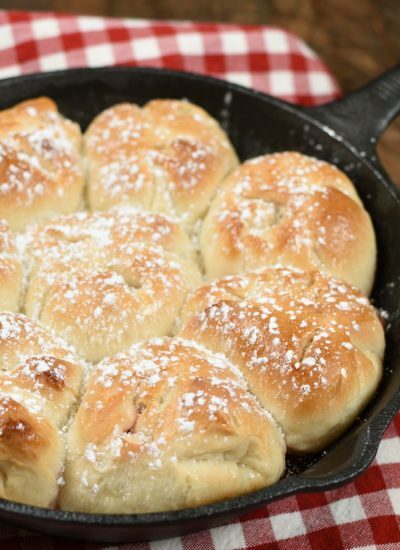 for 12 adults and a make one and a half times this recipe and put in a 9 X 12 pan? You could follow the recipe exactly and put it in a 9 x 13 pan. It would be a little shorter than the pictures of the one I made. Or, you could double it and put it in a 9 x 13 pan. The dessert would be super tall and barely fit in the pan. But more is better right! Thanks–this looks so good! I try to stay away from the frozen whipped ceam stuff…I don’t like the taste. Do you think more real whipped cream would work in the layer or would it need something added to stabilize it? I usually try to stay away from it too because real dairy whipped cream is better! It might need something to stabilize it. Sometimes I whip it twice and it works pretty good. Maybe that will help! Amy, I’m making your recipe for the no bake check cookies for a cookie exchange. As I was reading the recipe I perused many of your other recipes. Wow! I can’t wait to try several of them. You have a storehouse of great looking recipes! Awe thanks Beth! I’m so glad you found my site! All of my recipes are easy and family friendly! Thanks for stopping by!